It all began while talking to a bushfood processor who bemoaned the cost of getting barcodes - something like $2000 which would have given her 1000 codes, around 800 of which she didn't need. "We decided not to take this route - who needs 5000 barcodes anyway? Most native food producers could do with a dozen or less. There is an online shop to buy barcodes. While it is more expensive per code, you can buy 3, 6, 12 or however many you need. We bought 6. We own these, and there is no further subscription fee. They simply send you the camera-ready art by email. Worked fine for us. If anyone is interested...www.buyabarcode.com." This got me interested in barcodes generally and how they worked and where you could get them and why there was such a striking difference in cost. First of all, if you want to sell to a major (or even minor) chain, you have to barcode your products - otherwise they won't get through the check out. So the next obvious question is - what sort of barcodes are there? The type of product you're selling and the market you're selling to will dictate what sort of barcode you need. Retail stores tend to use the UPC/EAN barcode. Factories use the Code 128 barcode. If you are printing small barcodes then the best barcode to use is Code 128. If your barcode will be used in retail stores then you will probably need to use the UPC/EAN barcodes. This probably applies to most bushfoodies. 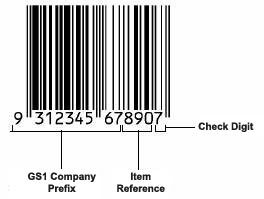 Australia has a cross-industry organisation called GS1 Australia that allocates barcode numbers. There is a charge to join ($550) plus an annual fee of $1,030.00 and $155.00 GST or $1,738.00 in total. "Gripon Australia will not sell barcode numbers as we do not believe it is ethical. We recommend that customers join GS1 Australia to get their barcode numbers. There are internet companies who will "sell" you one barcode. Be aware that these companies are not allowed by their GS1 registration terms and conditions to sell you one of their allocated barcodes. They cannot give you a certificate of registration from GS1 in your company name (which is required by the large retail chains to authenticate the barcode). The uniqueness of this barcode only remains whilst whoever you bought it from maintains their GS1 membership or until GS1 cancels this membership because they are in breach of the terms and conditions. Whilst EAN/GS1 membership may cost the equivalent of say 20 single barcodes bought from sources such as these online barcode sellers, you need to consider the following. What is the cost to your company's reputation if you are forced to re-label all of your goods? What is the potential real $ cost if one of your customers starts selling another product with the same EAN number. The official GS1 member will be fine but the other party will have to carry out a recall, then repackage and possible reimburse the store (remember the scanning code of conduct you see at the checkouts). If your product range and coverage in stores increases (as I am sure you hope it will) then you will end up joining GS1. All of your packaging etc you have already done will be wasted and will need to be redone. Considering the cost of having your packaging done and submitted for approval to the retailer. They then ask for the GS1 membership certificate (which you don't have) either initially or thru the regular supplier audit process they carry out. You now must have your packaging redone, join GS1, and then say goodbye to any money you have already paid. Be very aware of your risks involved in buying one barcode on the internet." Phew! Suitably worried, I thought I'd better visit the buyabarcode site and see how they answered all this. Their front page is littered with specials - you can buy one bar code for $US35 plus a once only set up fee of $US65 = $US100. Additional bar codes cost $US35 each and they had 3 bar code special for $US150 and a 6 barcode special for $US225. "Most people go to the Uniform Code Council to buy their barcodes. Then pay the $750 or more to join and then purchase the software that will allow them to generate the code. So the prospect of getting a bar code can sometimes lead to tears. In 1999, Eric Jacoby, a fledgling entrepreneur decided to figure out a better way. Subdivisions was born. Going to the Uniform Code Council himself, he joined, paid the dues, received his barcode prefix number, bought the software, figured out the printing issues, and read all of the fine print in the U.C.C. manual. To his surprise, after doing his homework, he realized that with his barcode prefix he could generate 100,000 12-digit UPC bar codes that would all be unique. And by selling these UPC bar codes one at a time, he could make life easy for anyone out there who only really needs a few bar codes at best. Well, he says he's read the U.C.C. manual and found a genuine loophole and it seems to be working for the Shephards, so why would anyone pay the extra?